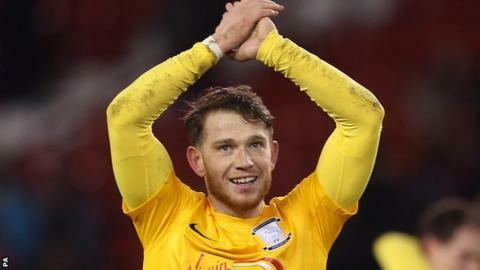 Joe Garner's hat-trick moved Preston to within one victory of promotion to the Championship as they beat a much-changed Swindon side. League One's top scorer Garner met Paul Gallagher's pass to lob over Tyrell Belford before the pair combined again, this time a header from a free-kick. Garner netted his 25th of the season from close-range on 51 minutes after Jermaine Beckford's effort hit the bar. Preston remain second and one point clear of MK Dons, who beat Rochdale. Swindon manager Mark Cooper made seven changes and handed first starts to Jermaine Hylton, Lee Marshall and Will Randall as fourth-placed Swindon now look ahead to the play-offs. "I thought the young boys did really well today, we think a lot of them. I thought they acquitted themselves fantastically well in a cauldron. "We want the play-offs to come around but we have to play these games. "We conceded an early goal but after that I thought we played really well in the first half and dominated." On his team selection: "It's about us and how we want to prepare. It's entirely about our preparation for the play-offs, and making sure that the team that plays in the first play-off leg is ready - free of injury, fresh mentally and physically. "It might not work, but we've put a plan in place that we think gives us a realistic possibility of doing well in the play-offs. "We're not meaning to antagonise anybody. We're trying to do what's best for Swindon Town." Match ends, Preston North End 3, Swindon Town 0. Second Half ends, Preston North End 3, Swindon Town 0. Attempt saved. Kevin Davies (Preston North End) header from the left side of the six yard box is saved in the centre of the goal. Substitution, Preston North End. Neil Kilkenny replaces John Welsh. Jack Barthram (Swindon Town) wins a free kick on the left wing. Substitution, Swindon Town. Josh Cooke replaces Michael Smith. Attempt missed. Kevin Davies (Preston North End) header from very close range is just a bit too high following a corner. Corner, Preston North End. Conceded by Jack Stephens. Substitution, Preston North End. Callum Robinson replaces Jermaine Beckford. Michael Smith (Swindon Town) wins a free kick in the attacking half. Tom Smith (Swindon Town) wins a free kick in the defensive half. Attempt missed. Chris Humphrey (Preston North End) left footed shot from the right side of the box is high and wide to the left. Substitution, Preston North End. Kevin Davies replaces Joe Garner. Tom Smith (Swindon Town) wins a free kick in the attacking half. Attempt missed. Paul Gallagher (Preston North End) right footed shot from the centre of the box is just a bit too high. Corner, Preston North End. Conceded by Will Randall-Hurran. Attempt saved. Joe Garner (Preston North End) right footed shot from outside the box is saved in the centre of the goal. Substitution, Swindon Town. Tom Smith replaces Anton Rodgers. Attempt saved. Tom Clarke (Preston North End) right footed shot from the centre of the box is saved in the top centre of the goal. Attempt missed. Jordan Turnbull (Swindon Town) left footed shot from outside the box misses to the right. Attempt missed. Joe Garner (Preston North End) header from very close range is just a bit too high. Corner, Swindon Town. Conceded by Scott Laird. Corner, Swindon Town. Conceded by Bailey Wright. Substitution, Swindon Town. Andy Williams replaces George Barker. Jermaine Beckford (Preston North End) hits the bar with a right footed shot from the left side of the six yard box. Goal! Preston North End 3, Swindon Town 0. Joe Garner (Preston North End) header from the right side of the six yard box to the top right corner. Attempt missed. Joe Garner (Preston North End) header from the right side of the six yard box is just a bit too high. Attempt blocked. Daniel Johnson (Preston North End) right footed shot from outside the box is blocked. Attempt blocked. Scott Laird (Preston North End) right footed shot from outside the box is blocked. Corner, Preston North End. Conceded by Lee Marshall. Second Half begins Preston North End 2, Swindon Town 0. First Half ends, Preston North End 2, Swindon Town 0.